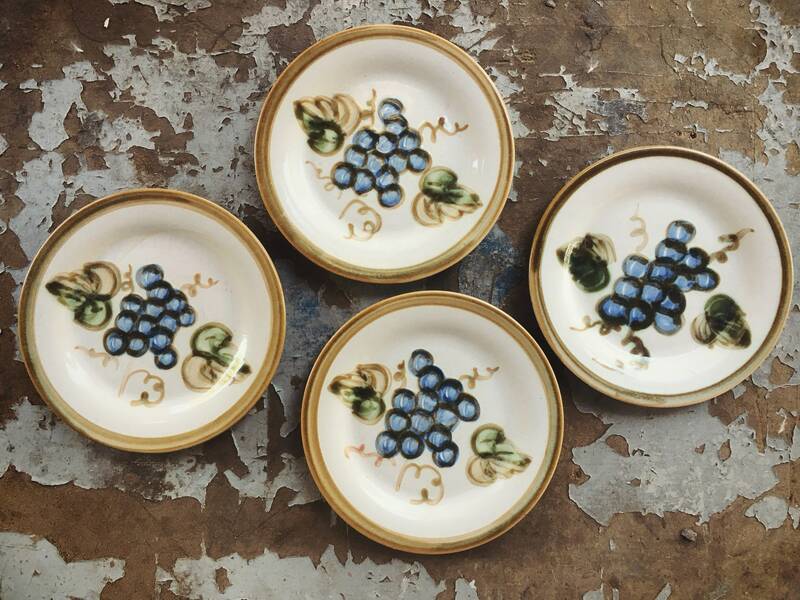 Here are four vintage John B. Taylor small plates--salad, dessert, or bread plates--from a pattern called "Vintage." I picked these up as they looked like the design of Louisville potter Mary Hadley, whom I have collected and sold. It turns out that Hadley worked for Taylor for a couple of years before in 1940 starting her own business. From a website about John B. Taylor: "The JB Taylor Company was founded in 1815 in Louisville, Kentucky. But it was not owned by John B. Taylor until 1938. In 1970 the company was sold and became known as Louisville Stoneware. Some of the old patterns are still in production as well as many new designs. 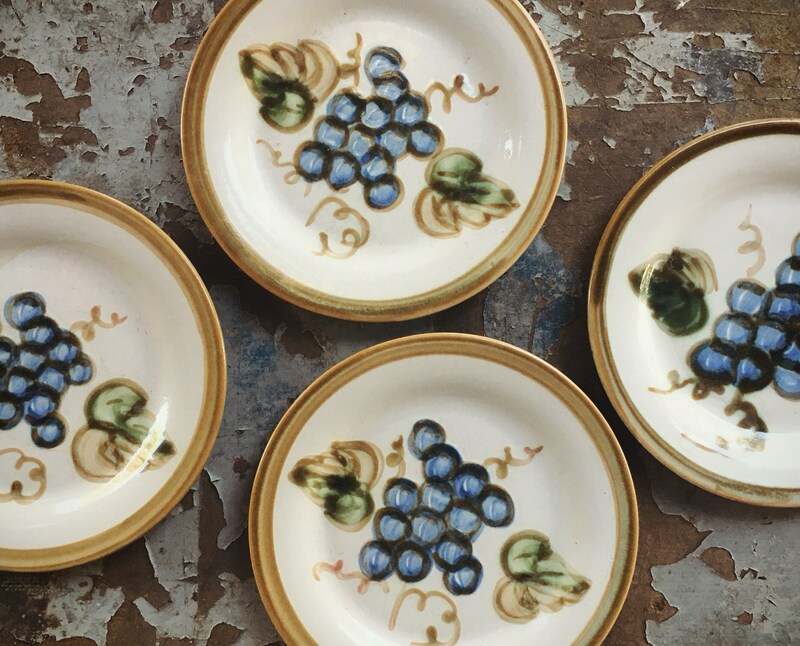 Some of the oldest patterns include Harvest and Vintage. 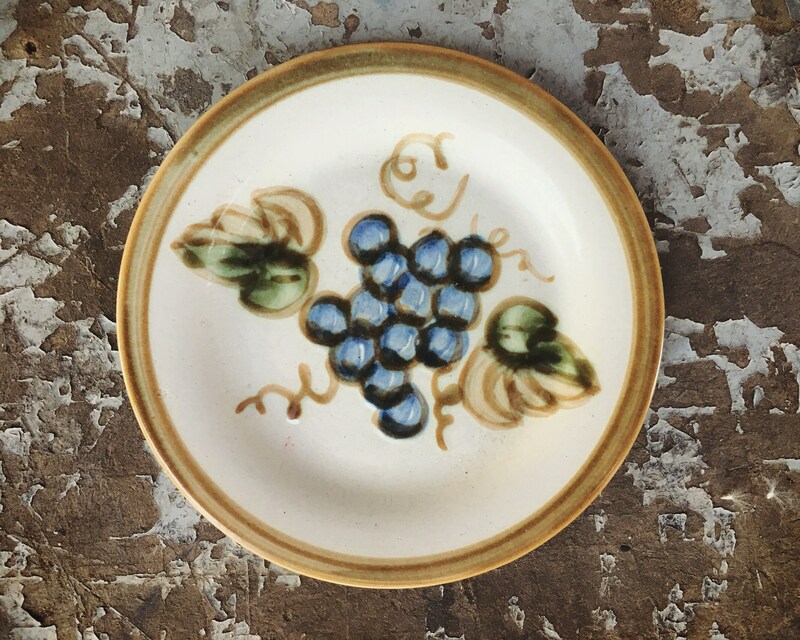 In the earlier days, the artists were likely to experiment with different designs and you can occasionally find a unique treasure in antique/consignment shops. 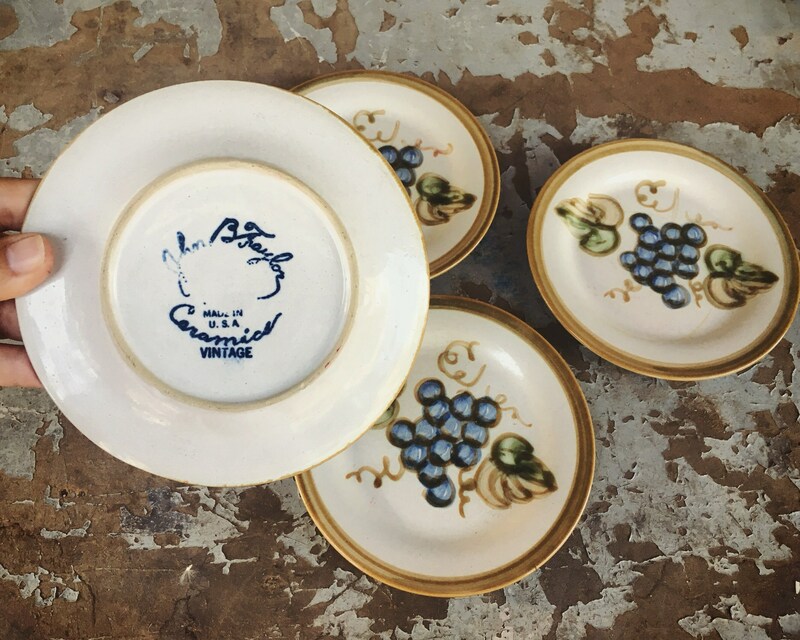 Because Louisville Stoneware still uses the original designs today, to identify the oldest it has to be marked John B Taylor." 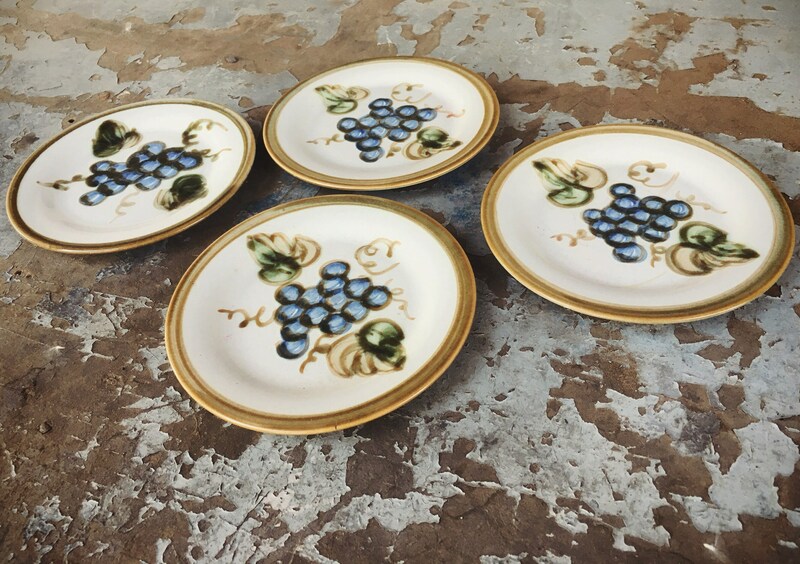 We date these four small plates to the 1960s, as that was the decade when the pattern name, in this case "Vintage," was added to the signature. By 1970 the company was sold, and while the patterns were (and are) still made, they no longer carried the John B. Taylor name. 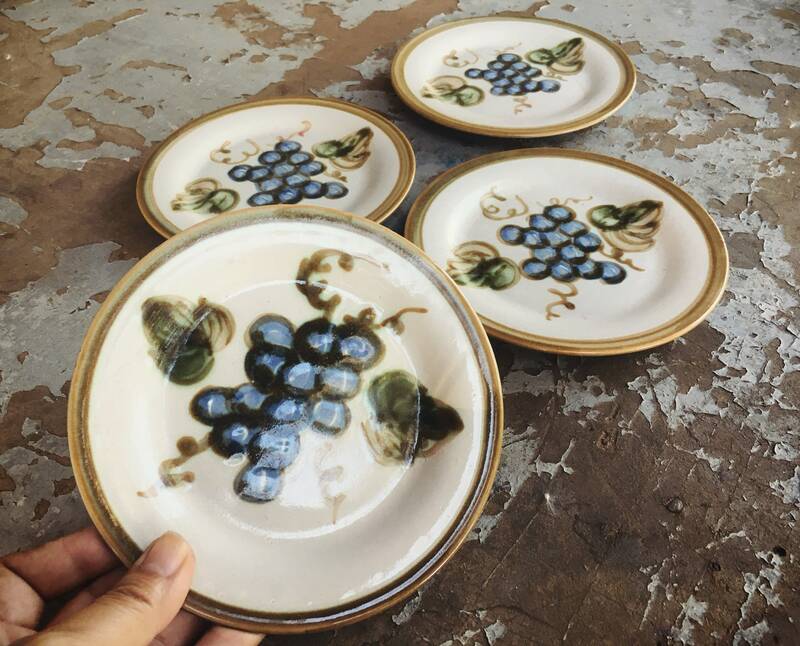 The plates/saucers are small, measuring just over 6" in diameter. They are all hand-painted, owing for the differences in the design. All carry a script John B. Taylor Made in USA Ceramics signature and the name of the pattern on the back, although in some cases the signature has rubbed off and is barely legible. There are some divots along the base on the back, but no chips or cracks on the front. The plates have crazing from age. Kentucky to New Mexico...South by Southwest.